A trio of dormers with arch-topped windows, a splendid oval window, and a wrapping front porch with gable entry create a genteel facade for this modest and affordable farmhouse. The great room is generously proportioned and open to the kitchen and breakfast area with delightful bay window. Another bay window expands the dining room, and front and back porches provide ample outdoor living space. 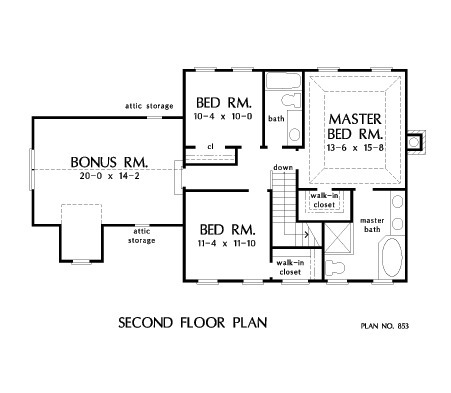 The master suite is located on the second floor with two family bedrooms and a sizable bonus room. A tray ceiling tops the master bedroom, which features a walk-in closet and private bath. Note the large storage room in the garage. 2nd Floor: 823 Sq. Ft. Bonus Room: 331 Sq. 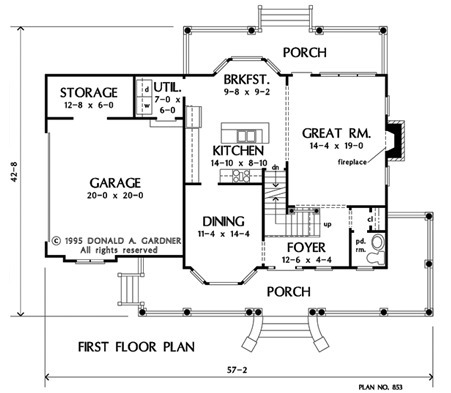 Ft.
House Dimensions: 57' 2" x 42' 8"
Great Room: 14' 4" x 19' 0"
Master Bedroom: 13' 6" x 15' 8"
Foyer : 12' 6" x 4' 4" x 9' 0"
Dining Room : 11' 4" x 14' 4" x 9' 0"
Great Room : 14' 4" x 19' 0" x 9' 0"
Kitchen : 14' 10" x 8' 10" x 9' 0"
Breakfast Room : 9' 8" x 9' 2" x 9' 0"
Utility Room : 7' 0" x 6' 0" x 9' 0"
Bonus Room (Cathedral): 20' 0" x 14' 2" x 11' 2"
Garage : 20' 0" x 20' 0" x 0' 0"
Garage Storage : 12' 8" x 6' 0" x 0' 0"
Master Bedroom (Tray): 13' 6" x 15' 8" x 10' 6"
Bedroom #2 : 10' 4" x 10' 0" x 9' 0"
Bedroom #3 : 11' 4" x 11' 10" x 9' 0"
Porch - Front : 43' 6" x 7' 0" x 0' 0"
Porch - Rear : 30' 2" x 7' 0" x 0' 0"